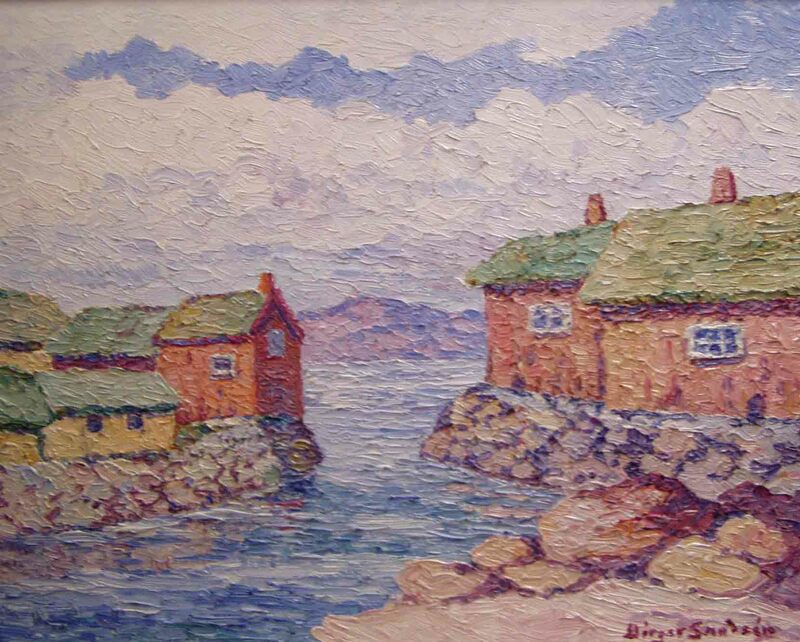 A new and vital period in the life of Birger Sandzén began early in 1891 when he departed for Stockholm to develop his interest and talent in painting. His plans at the outset included enrolling as a student at the Royal Academy. The list of applicants to the Academy, however, was long and there were no vacancies. Instead, kindly fate dramatically changed young Sandzén’s life when he learned of a class being formed by Anders Zorn (1862-1920), one of the Sweden’s greatest painters and etchers. Sandzén hurried to meet Zorn, fellow painting teacher Richard Bergh (1858-1919), and sculpture and drawing teacher Per Hasselberg (1850-1941). In the autumn of 1891, he was accepted as one of six men and two women to study in a small studio on Nörra Smedjegatan in Stockholm. As the number of students increased, a larger studio on Mäster Samuelsgatan was rented and paid for by the class. In class, Zorn taught Sandzén to have a feeling for color and to paint broadly and vigorously without being afraid. The class later became known as the Konstnärsförbundet (Artists League). When Zorn could no longer continue to teach the class, Birger was selected by his fellow students to join Bergh in establishing rules and regulations for the Konstnärsförbundet School. At the end of his studies, Zorn and Bergh recommended that Sandzén complete his painting studies in Paris. After a period of compulsory military training and a visit to his parents and family at Järpås, Sweden, Sandzén left early in l894 for Paris where he lived in the Hotel de Brest on La Rue de Rennes. At the suggestion of Richard Bergh, he began painting in the studio of Edmond-François Aman-Jean (1860-1935), a painter who had exhibited his works and won distinguished prizes in many leading European galleries and at L’Ecole des Beaux-Arts. 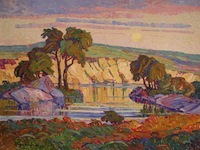 Aman-Jean was closely associated with Ernest Laurent (1859-1929) and Georges Seurat (1859-1891) in promoting impressionism, including pointillism (often called divisionism). Aman-Jean and Seurat had shared the large studio into which Sandzén was accepted for painting classes in 1894. The young Sandzén profited greatly from his experience in the class and the teaching of Aman-Jean. 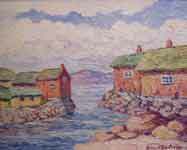 Of primary importance was introduction to the pointillist approach to painting. His study in Paris was enhanced by the cosmopolitan life of the city, salon shows, visits to museums and concerts. 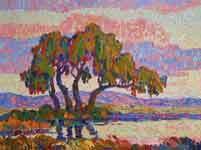 Later, upon arrival in Kansas, his painting expressed the pointillist manner from approximately 1911 to l913. His study of color and light associated with pointillism is clearly evident in paintings which are in the gallery’s collections. After 1913 one can observe that he is beginning to combine the pointillist palette of colors with a brushstroke that will later become as vigorous as that of his teacher, Anders Zorn. 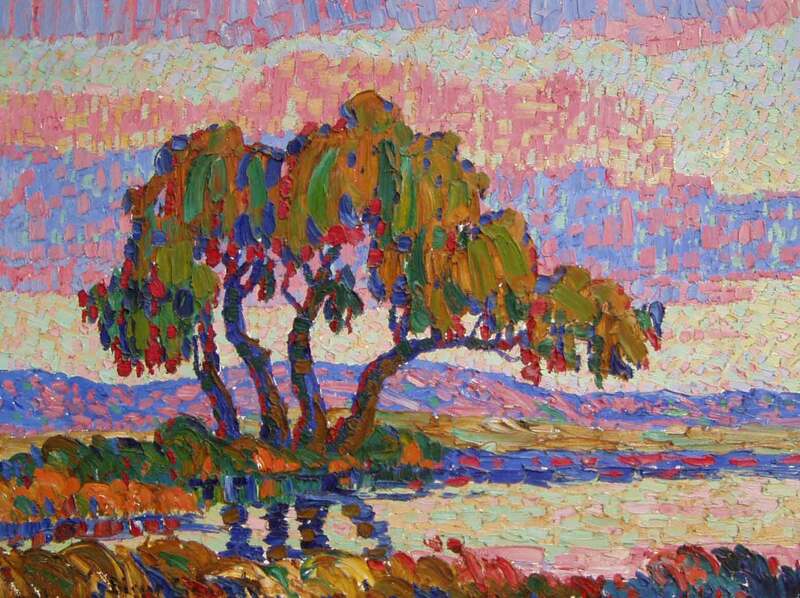 Yet his painting would also continue throughout the rest of his life to present pure colors that blend together when seen from a distance producing a luminous effect found in pointillist painting.